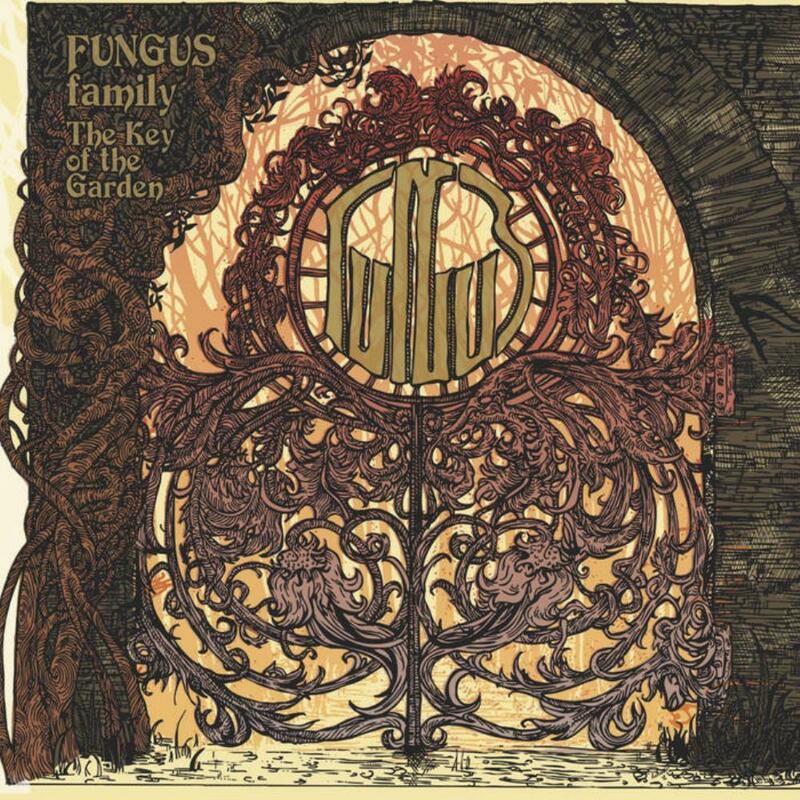 Starting out as a psychedelic band, Fungus from Genua, Italy has been around since 2002. They have since established themselves as a Heavy Prog band. After releasing an EP, 2 live albums and their 3rd full length album in 2013, the band has finally come back with their 4th studio album "The Key of the Garden" released in March of 2019. This album is the 3rd in a series revolving around a concept together with "Better Than Jesus" and "The Face of Evil". The album is made up of 9 tracks (7 on the vinyl version, the "Pink Floyd" and "Family" covers are left off of the LP) and the album runs for just over an hour. The line up consists of Dorian Deminstrel on vocals and acoustic guitar, AkaFuzz on guitar, Claudio Ferreri on keyboards and synths, Carlo Barreca (the only original member still in the band) on bass, flute and trumpet, and Cajo on drums. There are a couple of guests on the album also adding additional flute, sax and percussion on a few tracks. The album starts with the 9+ minute "Suite No. 5 ? Part I". A bright synth and guitars bring it all together with a progressive beginning which soon lightens up a bit to bring in the vocals. The vocals are deep, yet not really heavy. The accent is heavy on the English vocals, but not annoying. When the track gets a little heavier, the vocals respond by getting more dramatic. A sudden shift in tempo at 4 minutes happens, speeding up the drums and a very nice bass solo before a guitar solo starts, supported by organ. Later, things go suddenly dark and dramatic and after this, moods and meters change quite often, proving that the band is definitely progressive. You even get an acoustic section with whistling thrown in before it returns to a softer section which intensifies before the end. Right off the bat, it can be noted that Dorian's vocals are at their best on the heavier and dramatic sections. "Eternal Mind" starts with a nice hook which involves the guest flautist Nik Turner. The feel is in a pastoral style reminiscent of "The Moody Blues", but with a dramatic vocalist. Things do get heavier on the instrumental break when the guitar busts in with a vengeance. "Demo-crazy" is a much heavier track with churning guitars and a blues-inspired beat further supported by an organ and a progressive vocal melody. "1Q84" is an epic 12 minute track. This starts with a psychedelic edge as stylized by "The Doors", as the vocalist does his best Jim Morrison imitation. After 2 minutes, however, we get a good guitar solo and a progressive section that takes the track to its next section, this time with heavier sound in the guitars and keyboards and the return of more dramatic vocals. More progressive rhythm and a bit of complexity follow this until things smooth out for a synth solo after which follows a soft section that builds with a guitar driving the intensity forward. Next it moves into an "Iron Butterfly" feel as the track continues. Then a bit of Pink Floyd style acoustic strumming before it returns to The Doors style again. With all of this name dropping, the track seems like it can be a bit choppy, but there are some really good passages throughout the track, so it's not a complete write off, it just seems like it is trying to fit too much into one track, when fewer sections and more development would have strengthened the track. "Becoming to Be" has the stoner vibe with a slowed down, yet heavy sound complete with fuzzy guitar and organ. The big surprise here is a growling sax that actually fits in with the heavy tone as it imitates the guitars. Nik Turner plays the sax this time as a guest. Later in the track, the mix of guitar and sax almost give it all a chaotic feel before things calm down for a returning vocal section. "Suite No. 5 ? Part II" follows this with a slight return to the feel of the first track. Since this is a shorter track than the first part at just over 4 minutes, the vocals come in much earlier this time. The last section of the suite doesn't come in until after 3 minutes, but it does give a feeling of finality to the suite with a stately heaviness which gets finished off with a guitar solo and synth riff. But, that's not the end of the album, just the suite. A surprise cover follows this on the non-LP version of the album with the Pink Floyd track "See Emily Play". The track retains its psychedelic sound, but looses a bit of "umph" even with its heavier sound. After this we get the track "Holy Picture" which is over 10 minutes. This starts with a nice piano accompanying vocals. This soft section exposes the vocalists weaknesses with softer sections, but it builds nicely later and the drama starts again, but that is the vocalist's forte. There is an obvious edit in this track as it leads into a guitar and synth improvisation, because this expanded section is recorded live. You will hear a sudden change in the timbre mostly in the drums when it goes into the live section. This will continue to the end of the track. The last track is another cover (again not on the LP version) from "Family" called "The Weaver's Answer". I'm not a big fan of Fungus' version here, at least until it goes into the progressive instrumental break, but the vocal sections are kind of choppy sounding. Even though the vocals are a bit shaky in a few places, Dorian shows his strength in dramatic vocals. The music is very retro sounding, which is not a bad thing. The timbre even sounds old in a few places, and a few sloppy cuts almost make it authentic like it actually came from the late 60s or early 70s. There are some impressive sections, but in the longer tracks, some of those sections could have stood a bit more development and maybe fewer subsections. All in all, I find it entertaining enough, and I tend to think this album falls between 3 and 4 stars, but it's one that probably tips the scales into its favor with some great sounds and the nice retro feel.